Joint programs in regional hospitals are less sensitive to geopolitical disagreements. The desire and energy of Russian and U.S. scientists are what fuel cooperation between Russia and the United States in the field of medicine, which takes place mainly on a non-governmental level. Research centers, universities and associations forge collaboration agreements between themselves. Lately, the most important areas in this cooperation have been perinatal medicine, cardiac surgery and oncology. This year, scientists are planning to test a new joint vaccine based on a former cancer diagnostic technology that scientists at Arizona State University developed. The Russian-American Anti-Cancer Center, created in 2013 in the Altai Territory, is researching this method. Pre-clinical tests of the anti-cancer vaccine are showing good results, and scientists are planning to vaccinate laboratory dogs. “We have now begun testing samples from patients with breast and lung cancer,” said Andrei Chapoval, director of the Russian-American Anti-Cancer Center. The Russian side includes scientists from Altai State University and the Altai Division of the Russian Academy of Medical Sciences Oncology Faculty, as well as the Institute of Chemical Biology and Fundamental Medicine of the Siberian branch of the Russian Academy of Sciences. The project uses a Russian scientific-experimental base and Arizona State University’s technology. Arizona State University professor Stephen Johnston developed the new method, immunosignaturing, which tracks immune reactions. Each disease provokes a response from the immune system, which shows whether a person is sick and what exactly the sickness is. To obtain an immunosignature, scientists place a drop of blood on a microchip the size of a microscope’s glass slide that contains 10,000 different amino acid sequences that react to the immune system cells in the blood. The method allows scientists to calculate the antibodies that develop in response to a certain amino acid sequence and to identify the disease before its clinical symptoms manifest, enabling the diagnosis of many kinds of diseases. The experiment in the U.S. has already diagnosed 1,500 people with various illnesses, including oncological ones. Siberian scientists expect to obtain a certificate to use peptide microchips by the end of this year, meaning that in 2015, the diagnostic method may be available for patients in Russia. The idea to create the Russian-American Anti-Cancer Center was born in 2012 at the Barnaul International Conference on Nanotechnology, in which Russian scientists met representatives from Arizona State University. A year later, they signed a collaboration agreement. The laboratory is the first outside the United States, Johnston says. Its objective: to revolutionize disease diagnostics and bring the technology to the clinics. Joint programs from various associations and regional hospitals are also less dependent on the political situation. For example, the Russian-American Medical Association (RAMA) has been operating in Russia’s regions since established in 2002, when it was established by surgeon Boris Vinogradsky. Vinogradsky had moved to America from Yaroslavl more than 20 years ago, and after long training and requalification, opened his own private surgical practice in Cleveland. Members’ contributions largely finance RAMA, whose objectives are to assist medical workers from Russia and the United States; help improve methods of taking care of the sick; support scientific research; and represent its interests in professional circles. Among RAMA’s members are more than 500 doctors from 40 American states. mostly Russian-speaking doctors working in the U.S. The association has already successfully completed a series of joint projects, including a 2013 agreement with the perinatal center in the Tomsk Region. Per the agreement, American doctors come to Tomsk twice a year on medical missions in which they examine patients and conduct master classes and seminars. In turn, Russian specialists gain practice in the United States as interns. According to head physician Igor Stepanov, infant mortality in the region, which is one of Russia’s best indicators, now occurs in 4.7 cases out of 1,000. The country’s average from January to June 2014, according to the Health Ministry, was 7.5 children out of 1,000 born. Vinogradsky admits that the American health system is not ideal, but thinks it has many advantages. RAMA began its activity in Russia with projects in the Yaroslavl Region, Vinogradsky’s birthplace. The association collaborates with the Yaroslavl Regional Hospital in cardiology, and recently gave the hospital 10 heart valves developed and produced in the U.S. and $100,000 in supplies. 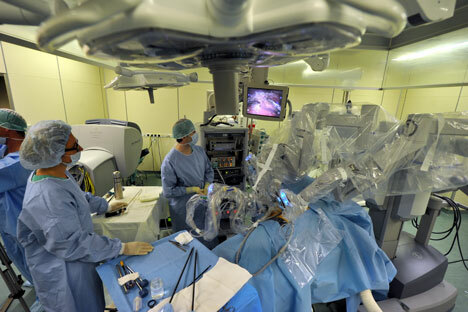 American specialists are interested in such missions to develop their careers, including cardiovascular surgeon Jerry Durham. Visiting Yaroslavl for the first time, Durham told his Russian colleagues what he hoped to learn from them. “In Russia surgeons use certain operating techniques that American surgeons don’t,” Durham said.